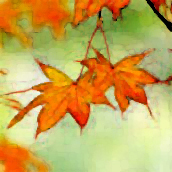 Autumn marks the season of change, the bountiful harvest of what we have planted. It marks the change and the end, a time of life review: past, present and future. There are several holidays that mark this change, one is Samhain (pronounced sah win) on November 1, (often referred to the day of the dead), and of course there is the traditional New Years Day on January 1, as well as ones birthday. Rituals, Celebrations & traditions mark time. Samhain is the New Year of Gaia (Mother Earth) and most commonly known through the Celtic traditions. It is a holiday that comes halfway between fall equinox and winter solstice. We offer two ceremonies here to mark this changing season with a ritual. Both ceremonies focus on reviewing your past year to help give you a sense of accomplishment and an understanding of the inner and outer “work” still to be explored. There is a strength and peace that comes from remembering your successes over the last twelve months and the clarity of what deserves completion, so you can make plans for your future. These types of rituals offer a sense of well-being and purpose. Here is a simple ritual I read about recently that we are implementing in our life. At New Years (either November 1 and/or January 1), in a very gentle 3-day process, spend some time the first morning walking in nature and reviewing the occurrences of your past year. Contemplate your accomplishments and lessons, review the projects still in process, and feel the disappointments and the joys. Most importantly, be honest and loving with yourself. On the second morning, again walk in nature and reflect on what you would like to see happen in the coming year. This is not a “should” event, rather a walk of feeling what would bring you joy and a sense of achievement. Consider your values and purpose; think about places you would like to see and people you would like to know. Reflect on the qualities of being you would like to attract in your life. On the third morning, with a cleansing ceremony for your home and a personal celebration (i.e. : light candles, burn incense, etc whatever ritual that clears out the old and welcomes the new), write out your intentions for the next year. Write from your heart, without analyzing. Then fold the paper, place it in an envelope or container and seal it. Next year, open the previous years intensions and review your list and mark your accomplishments. Note the percentages of completion as a curiosity (not in judgment). This tradition brings into practice a way to celebrate change, our past, present and future actions along our journey. This is a tradition that has been in my sister’s family and takes place every December 31. An hour or so before midnight write down your thoughts about things that you would like to be free from. Perhaps there are things that have happened this past year you would like to release, let go of and be free. Write them down. (example: “May I be free from worry.” “May I be free from pain.”, “May I sell my house.”, “May I be free from…” Make sure you list each item separately on a separate piece of paper. Prepare a fire or use a burning bowl. Before midnight read each item out loud and one by one burn the item, letting go all the thoughts and feelings that you want to release, marking an end. After midnight, write down all the things you would like to cultivate in the coming year. (example: “May I be happier.”, “May I cultivate more kindness.”, “May I build my dream house.”, “May I write the my book.” “May I spend more time in my art studio making art.” Write down whatever you would like to accomplish in the coming year, either in states of being or actual goals. After you finish writing out what you want to cultivate in the coming year, then read each one out loud and burn each one as an offering. Celebrations & rituals support your path to awakening. These traditions mark not only the passage of time, they ritualize your process as you explore the journey within. I wish for you a bountiful year of joy, happiness, healing, laughter, success and love.